After years of research, some light is finally being shed on the mysteries of Chevrolet A-body production totals. 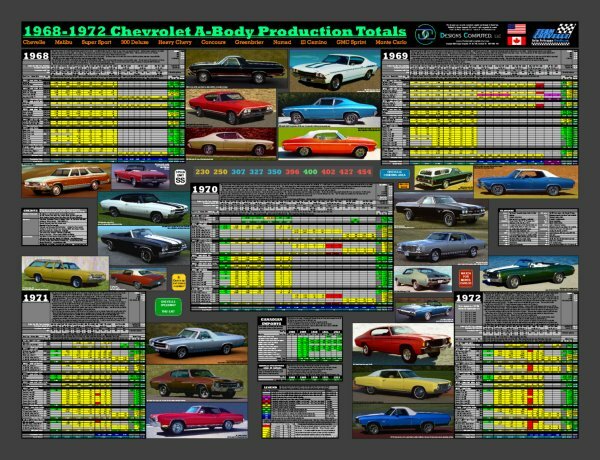 Daniel Carr has designed a new print showing detailed production tables for all Chevelle models including 2-door sedans, 2-door coupes, 2-door convertibles, 4-door sedans, station wagons, and sedan pickups. Included are detailed production totals for the Chevelle’s cousin - the Monte Carlo, as well as the El Camino’s cousin - the GMC Sprint. Data on US-built and Canadian-built cars is also presented. The print also shows images of 25 selected vehicles in vivid color. Anyone who appreciates these cars will find it to be a very impressive "work of art" for display in any office, den, or garage. It is printed on heavy 80# paper stock, and has the look and feel of fine art prints. At 42 by 32 inches, it is very large. The large size was necessary for displaying all the relevant information. A person could literally spend hours pouring over all the details presented. Every piece of available information was utilized to compile the data, including model totals, option totals, and engine totals. Production totals are given for every model and engine combination. And on big blocks, the production totals are even broken down by manual and automatic transmissions for every model. Where there is missing data, the holes have been filled in using statistical techniques (interpolation) to generate unbiased estimates. The data charts are color coded, so it is obvious which totals are estimates, and which totals are derived directly from Chevrolet reports. The often-asked questions, such as "how many 1969 Chevelle SS-396 4-speed convertibles did they build", have finally been answered with some degree of confidence. It is interesting to see that many well-known models may not be quite as rare as previously thought, while many lesser-known varieties are indeed very unusual. The 25 vehicles pictured on the print cover a wide variety of models, including many of the rarest and most desirable versions. 3. Tonawanda totals. The Tonawanda engine plant is where all the big-block motors were manufactured. These records show how many such motors were built for each model year. The number of motors built was usually more than the number of cars built (by about 2% to 20%) because some extra engines were normally built for service replacements. These totals were broken down by transmission type (automatic or manual), so they can be used to generate accurate estimates of the number of big-block cars with automatics and manuals. Separate totals were also recorded for the 2-speed automatic cars in 1968, as well as the heavy duty 3-speed manual cars in 1971-72. This may sound fairly complete, but it does not answer the type of question that is frequently asked, such as: "How many 1970 SS-396 Chevelle coupes were built ?". The answer to this and other similar questions will probably never be known for certain. The reason is that in any given year (after 1968) there is no way to know how many of the SS options were applied to coupes, how many were applied to convertibles, and how many were applied to El Caminos. All that is known is the total number of SS options (on all models) for the year. This same situation exists when trying to determine how many of a certain model were built with the various engine/transmission types. I have seen some rather low production totals being touted for certain cars. The 1970 LS6 convertible and LS6 El Camino come to mind. Suspiciously, the quoted numbers also seem to be getting smaller and smaller over time. I have seen claims of 20 LS6 convertibles and 25 LS6 El Caminos. I found this low total for the LS6 El Camino especially hard to believe since there were no less than three genuine examples running around my small home town in the 1980s. I began some extensive research to see if there was any basis in fact for the quoted numbers. I found none. What is known is that there were 4,475 US-built 1970 LS6 vehicles (this does not include an unknown quantity of Canadian-built LS6 coupes that were imported into the US). There is no way to know how many of the 4,475 LS6 vehicles were coupes, how many were convertibles, and how many were El Caminos. If there really were only 20 LS6 convertibles and 25 LS6 El Caminos, then there would have to be 4,430 LS6 coupes. If those numbers are to be believed, it would mean that only about one half of one percent of all LS6 vehicles were convertibles and El Caminos. And yet, if one looks at the total number of US-built cars for the 1970 model year that could have been ordered with an LS6, the percentages are vastly different than that. There were 289,622 1970 V8 Malibu coupes, 7,141 1970 V8 Malibu convertibles, and 40,728 1970 V8 Custom El Caminos, yielding a grand total of 337,491 US-built vehicles that could have been ordered with an LS6. This grand total breaks down as 85.8% coupes, 2.1% convertibles, and 12.1% El Caminos. To come up with a statistically-based estimate of the LS6 convertible and El Camino totals, these model percentages can be applied to the 4,475 LS6 total. This yields estimated US totals of 3,840 LS6 coupes, 95 LS6 convertibles, and 540 LS6 El Caminos. (Note that the LS6 coupe total shown on the print includes an estimated number of Canadian-built LS6 coupes imported into the US. No 1970 convertibles or El Caminos were built in Canada). This estimation technique can be visualized in the following manner. Take 289,622 red marbles (coupes), 7,141 green marbles (convertibles), and 40,728 blue marbles (El Caminos) and throw them all in a bin. Stir them up randomly. Now blindly pull out 4,475 (LS6) marbles. Statistically, you would expect 3,840 of those to be red (coupes), 95 to be green (convertibles), and 540 to be blue (El Caminos). Of course, this technique is not infallible, but it is unbiased. Unless Chevrolet discovers and releases some new data (which becomes less and less likely with each passing day), these estimates are the best that can be obtained. A quantity of 540 may sound like a lot of LS6 El Caminos, but that is still a low production total for any type of car. When you consider the high attrition rate for these vehicles, it is easy to understand why very few are seen today. Could Chevrolet have sold 540 LS6 El Caminos ? Would anyone want a high-performance car/truck hybrid ? The data from 1968 can be used to help answer this question. In 1968, the SS-396 coupe, SS-396 convertible, and SS-396 El Camino were separate models, unlike later years where the SS was simply an option package. This means that the exact production totals for the different 1968 SS-396 models are known. Records show the 1968 SS-396 totals were comprised of 55,309 coupes, 2,286 convertibles, and 5,190 El Caminos. This equates to 88.1% coupes, 3.6% convertibles, and 8.3% El Caminos. This shows that the SS El Camino was probably a significant component of the SS total for any given year. This type of statistical interpolation technique is the basis for the totals on this print. When available, data that can be taken or derived directly from Chevrolet reports is used (and shown in shades of green or blue). Where necessary, the statistical interpolation method is used to fill in the missing data (which is shown in shades of yellow or red). I decided to include the Monte Carlos in this project since they have a lot in common with the Chevelle, and because Chevrolet included the Monte Carlo RPO totals with the Chevelle. When it came to GMC Sprint totals, it seemed that practically no data at all was available. But after studying the 1971 and 1972 Chevrolet RPO reports, it became clear that these totals also included options installed on GMC Sprints. They were probably included because the GMC Sprint was built on the same assembly lines that built El Caminos, Chevelles, and Monte Carlos. An example of the type of research that went into this print can be seen in the GMC Sprint SP totals. The GMC Sprint SP was similar to the El Camino SS, and any production totals on them would be of great interest. The available RPO reports did not list the GMC Sprint "SP" option (YE7). However, it was still possible to derive exactly how many 1971 and 1972 GMC Sprint SPs were built. The 1971 report, for example, shows that there were 19,542 vehicles built with RPO PM7 (white letter tires). From researching build sheets, it was apparent that PM7 came on every 1971 Chevelle SS, El Camino SS, and GMC Sprint SP (but not on any Monte Carlos or on any other cars). The 1971 report also shows that there were 19,293 Chevelles and El Caminos built with the RPO Z15 SS package (the Monte Carlo had a different RPO Z20 SS package). Since the only way to get PM7 on a car was to order it with Z15 or YE7, the YE7 total must be the difference between 19,542 and 19,293. This yields a total of exactly 249 1971 GMC Sprint SPs. The same procedure was repeated to derive a total of 749 1972 GMC Sprint SPs. The yearly tables show all the totals broken down by model and major appearance package (such as SS, Concours, and Heavy Chevy) and by certain performance options (Cowl Induction). Each row of each table is for a different model or major appearance package/option. The columns show the totals broken down by each available engine (and transmission type). The production totals are shown in a spread-sheet fashion. I thought about breaking them down by additional options, but decided not to for two reasons. First, it becomes more and more inaccurate and meaningless to make further breakdowns. No matter how common a car is, you could make it sound rare by applying too many percentages. Second, the tables were already fairly complex and adding more would make them harder to read. I would have liked to show how many cars came in each color, but since the paint color was not technically an extra-cost RPO, but rather a free choice, the RPO reports do not show totals for the various paint colors. Chevrolet has never released any data on paint color totals for these cars. Another great challenge in producing this print was to determine what was, and what was not, actually built. Various Chevrolet documents often contained conflicting information. For example, the 1972 Chevelle sales brochure implies that the 1972 SS package could be ordered with any V8, including a 307. However, the mid-year 1972 options price list indicates that only a 350 or larger V8 engine was available with the SS package. Needless to say, for the estimating technique to be effective, it is important to know exactly what was built. In cases where there is conflicting information, sales brochures carry the least weight since they were usually produced early, before production of the cars actually began. In most years, the RPO reports show the totals for all cars that were built and/or sold in the US. So, just like the RPO reports, the yearly tables on the print show totals for all cars built and/or sold in the US. There was a problem with the 1970 data, however. It appears that for 1970 only, the RPO totals report did not include Canadian-built cars imported into the US. An extrapolation technique was used to estimate the relatively small 1970 Canadian import totals, and those additional totals are included in the 1970 table. The print shows what is known about Canadian Chevelle production. The total number of each model built in Canada and imported into the US is known. Beyond that, however, it is not possible to get a complete picture of what exactly was produced in Canada and where that production was distributed. After researching all the data at length, I determined that it was time to compile everything in tables and put it on paper. For commercial distribution, an art print showing pictures of a variety of different models along with the tables seemed like a attractive way to accomplish that goal. This document is the result of that effort. The photographs provided yet another challenge. I wanted the images to have a photographic, but illustration-like look to them. The images have all been retouched using digital image processing software. Typical retouching involved removing stray reflections, removing distracting objects in the foreground and background, repairing film flaws, and color enhancement. My ultimate goal was to shed some light on the mysteries of Chevelle production. It is intriguing to see that some cars normally thought of as rare are actually more common than thought, while many other lesser-known varieties are indeed quite unusual. The Muncie M20 4-speed and L78 396 combination has been verified. The Muncie M21 4-speed was available with the LS5 454 (El Camino and probably Chevelle). The VIN prefix listed for the 1970 SS-454 Convertible (with Cowl Induction) should be "13667", not "13637". Recent data from GM of Canada indicate that, most likely, no 1970 LS6 coupes were built there. The poster suggests that as many as 288 LS6 coupes were imported from Canada. The poster totals for all 1970 LS6 coupes should be decreased by 7%, and the totals for all other (non-LS6) 1970 V8 coupes should be increased by 0.1% (negligible). Some or all of the M20 4-speeds used with the L48 4-bbl 350 may have been the iron-case Saginaw, not the aluminum case Muncie. Records show that there were 24,946 1972 RPO Z15 "SS" options and 19,595 1972 RPO F41 "heavy duty suspension" options. All indications are that F41 was a standard part of the SS package on Chevelle (from 1970-1972), but it was not available on any El Camino or Monte Carlo. The F41 option was apparently available (from 1970-1972) on any 2-door or 4-door V8 Chevelle coupe, convertible, or sedan (very few non-SS Chevelles came with F41, and if any were built they may have been for police/taxi applications). If true, then there must have been at least 5,351 1972 SS El Caminos (24,946 - 19,595 = 5,351). The print shows 4,780. So the 1972 SS El Camino totals should be increased by about 571 units, or12.0% across the board. This will affect some of the other estimates. The non-SS Custom El Camino totals should be reduced by approximately 571 units, or about 1.3%. The SS coupe totals should be reduced by approximately 571 units, or about 3.0%. The non-SS Malibu coupe totals should be increased by approximately 571 units, or about 0.3%. For the 1969 model year, the F41 suspension was not a standard part of the SS package, even on Chevelles. Records show that for 1969, F41 was available on ANY vehicle in the Chevelle line, including wagons and El Caminos. So, the 1969 F41 total can not be used as a guide in determining how many 1969 SS El Caminos were built. The 1969 F41 total was only 722 units, only a small fraction of the total number of 1969 SS coupes built. F41 was not available prior to the 1969 model year. The total shown for the L79 327 Malibu Sport 2-door coupe (without RPO ZK7) is "2213". It should be "2,213". 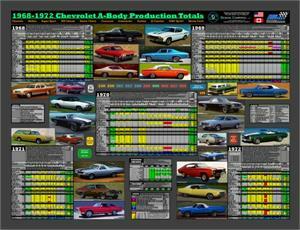 This table shows the number of Chevelles built each calendar year at the GM Caracas, Venezuela plant. The exact body styles and model year production totals are not known. No Monte Carlos were built there during 1968-1972. This table shows the number of Chevelles & Beaumonts built at the GM Port Elizabeth, South Africa plant. The exact body styles are not known. All were built during January to March, 1968. According to available records, no Chevrolet A-bodies were built there after March, 1968. It is not known how many (or if any) of these were Chevelles and how many (or if any) were Beaumonts. "Man! What a beautiful job! Thanks so much for donating them as door prizes at this year's Chevell-abration. Any Chevelle lover worth his Bowtie emblems will surely love to have your poster adorning their den, study, or shop (or maybe even all three!)" "I just got my print today and have to tell you that this is absolutely stunning FIRST CLASS work! I just can't say enough. When you actually see one you will know what I mean. At 42" wide that's an impressive layout of Chevelle information and pictures." "Visually spectacular and very informative." "I hang it on my wall with pride. Very attractive and very useful !" "It is obvious that it took a lot of time and effort to do this. You should be proud of the way it turned out. You have shown great skill in deriving production totals." "Looks great and has a lot of useful information." "Just received mine yesterday and it's beautiful. Excellent job! Promptly shipped and well protected too." "It is even better than I expected. You have done a great job. ... You are to be commended." "GOOD WORK DAN!! WOW! That poster is just fantastic...had mine delivered an hour ago and have to say that EVERY member of Team Chevelle deserves to have this hanging in their office or garage - IT IS THAT NICE!" "Received mine today and it is FANTASTIC!!!" "Got the print in the mail yesterday. Fine job. Damn fine job. Pat yourself on the back fella. Superb photography. I see that you really cleaned them up with your program. They look better than GM brochures!" "Just got my Dan Carr 68-72 production totals poster today an it is terrific. Thanks a bushel Dan!" "Awesome Job. It really has to be seen to appreciate [fully]".